A traditional Tagalog dish, Kare-Kare is a Filipino party favorite. It is made with oxtail, beef tripe (tuwalya) and vegetables cooked in thickened peanut gravy. The dish is yellow-orange in color and is made by using the hot oil steeped with achuete or annatto seeds. The sauce is flavored with ground peanuts and thickened by rice grains that have been toasted and powdered. 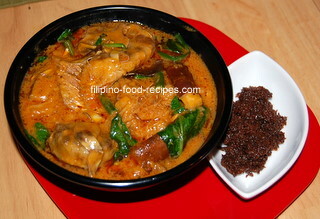 Kare-Kare is served with sauteed shrimp paste(bagoong). It's a perfect dish to pair with Crispy Pata (deep fried Pork Knuckles). 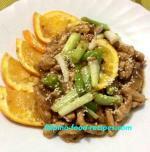 Nowadays, you can make this dish vegetarian or even seafood style. And also, I think it’s more practical to use peanut butter instead of toasting and grounding the peanuts. The oxtails take a long time to tenderize if you use the conventional simmering method. So I cook the oxtails in the pressure cooker. Then, I skim the fat off. The same is true with the tripe, which is the lining of the cow’s first and second stomachs. Tripe is as challenging to cook as the oxtail. The tripe needs to be cleaned and blanched thoroughly and it must be cooked for hours to make it tender and edible. 1 Heat up the oil, then put in the achuete seeds for a couple minutes until the oil becomes deep red. Strain out the seeds. 2 Saute the garlic and onion using the achuete oil, then add the oxtail and beef tripe, salt, pepper, sugar, beef broth and the dissolved-peanut butter. Bring to a boil. 3 Turn the heat down, and put the vegetables(except the Bok Choy leaves) into the sauce. Cover and cook for approximately 10 minutes or until the vegetables are done. 4 Add the dissolved rice flour into the sauce to thicken. 5 Add the Bok Choy leaves. Cook for another minute and it's ready to serve. The achuete oil can stain tile counters so be careful not to spill or splatter any oil. Although bleach can remove the stain, you may want to test it first to make sure it will not affect the color of the tiles. If string beans and Bok Choy are unavailable, substitute green beans for the string beans and spinach for the Bok Choy. The difference is negligible and the flavor of the dish will not be affected. I like a hint of sweetness for my Kare-kare so I add a tablespoon of sugar. If you are using a sweet peanut butter, you can omit the sugar. To cut some of the preparation time, try looking for Powdered Annato (Achuete) and Toasted Rice Flours which are readily available in the Asian Markets. They come in small packages with their equivalent Vietnamese or Thai names on the labels. Is this recipe a little too much work for you? If so, you can simplify it by using the Stew Base Mix for Kare-Kare that you can buy at any Asian store. I suggest, though, to try making it from scratch at least once, and compare the difference in taste.